Nintendo 3DS console has now been officially launched in the UK. Below you will find all the latest stock and price comparisons from the large UK retailers. Sunday 21 Apr - Top Picks - Amazon currently have stock of the 3DS Console (Red) (£124.99), 3DS Console (Blue) () and 3DS Console (Black) (£136.03) with Free Delivery. Nintendo have also released two special edition bundles Nintendo 3DS Console (Ice White) and Super Mario 3D Land () and Nintendo 3DS Coral Pink Console Bundle with Nintendogs and Cats - Golden Retriever (£165.00). 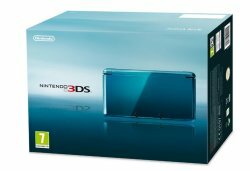 Nintendo have revolutionised gaming again with introduction of the 3DS console. The latest incarnation in the DS family of consoles sports a new screen capable of displaying 3D effects without the need for special 3D glasses (a process called autostereoscopy). 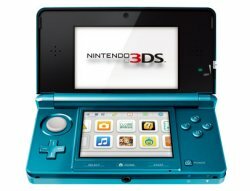 The 3DS has two cameras facing outwords, enabling the users to take 3D photos and capturing 3D video and a single camera facing inwords towards the player (above the top screen) capable of taking 2D photos and video. The larger 3.5 inch top screen has an impressive pixel resolution of 800x240 (to enable 3D viewing, 400 pixels are allocated to each eye). The bottom 3 inch screen is touch sensitive with a resolution of 320x240. The Nintendo 3DS console also boasts the latest in Wireless communication with the 2.4 ghz band. Multiple 3DS consoles will be able to connect to each other locally enabling seamless interactive gameplay. The 3ds will also connect to a LAN (Local Area Network) to access the internet enabling further online gameplay and online content. An additional feature entitled StreetPass will be an "always on" connection in the background which will automatically connect to any available wireless nodes (such as wi-fi hotspots) enabling the exchange of data whilst in spleep mode or whilst playing a game. An opt out feature will protect the users privacy. There is also an infra red port at the top of the console. Two speakers to the right and left of the top screen provide stereo sound. Additional game controls include a motion and gyro sensor to enhace the gaming experience. A "3D Depth Slider" allows the user to adjust the level of the 3D effect, depending on their personal preference. It is also reported the Nintendo have introduced a sophisticated new anti-piracy technology to the 3DS console to help protect against video game piracy. This has been a big problem in previous DS consoles with cheap pirated software being freely available which obviously contributed to lower profits for Nintendo. The Nintendo 3DS Console is also compatible with all existing DS games. Nintendo has reportedly made deals with major film studios to deliver 3D movies to the console. All in all Nintendo have yet again shaken up the world of video gaming with the first true 3D handheld gaming device.